Like many other popular woods, Spanish Cedar is inappropriately named. This dual misnomer of a wood is neither a Cedar, nor a Spanish wood. In reality, it’s a hardwood in the Meliaceae family, the same family as Genuine Mahogany, and this so-called Spanish wood actually hails from Latin America. From its appearance, Spanish Cedar could be easily confused with Genuine Mahogany. Both lumbers boast a reddish or pinkish brown coloring that deepens with age. Both also have straight graining, making them respond well to both hand and power machining. One of Spanish Cedar’s nicknames is “Cigar-box Cedar,” referring to a traditional use of the wood. Because, like true cedars, this wood has an insect-repelling fragrance, it was ideal for that application. Other characteristics that contribute to its popularity are its low density and resulting light weight and its high resin count, which increases its rot resistance. 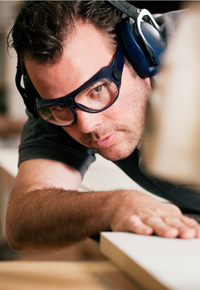 Other common applications of this wood include classical guitars, cabinetry, boatbuilding, plywood, and veneers. 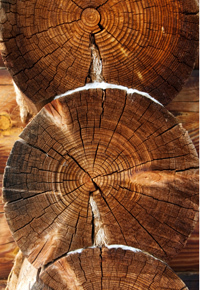 A downside of Spanish Cedar lumber is related to its low density, caused by a slower growth rate than other trees. Stability is adversely affected by Spanish Cedar’s low density, making it somewhat inferior to the otherwise comparable Genuine Mahogany. This instability can lead to warping; however, through proper drying techniques, such issues can be avoided. 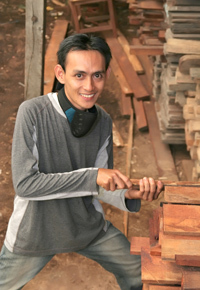 By kiln drying at just the right temperature, warping can be avoided without drying the wood out too much. With some of the only kilns in the country capable of properly drying Spanish Cedar lumber, lumber wholesaler J. Gibson McIlvain is a top choice for locating Spanish Cedar. When working with Spanish Cedar lumber, a few concerns to keep in mind involve cutting tools and respiratory problems. If sharp cutters aren’t used, the low density and softness of the wood can lead to fuzzy surfaces. The naturally occurring gum pockets may also clog saw blades, providing an additional challenge. The wood dust from this lumber has been cited as a respiratory irritant, so care should be taken to avoid breathing it in during finishing. While Spanish Cedar lumber continues to be readily available, its slow growth rate and high demand have landed it among those species considered “vulnerable” by the International Union for Conservation of Nature (IUCN). However, the wood’s presence on that organization’s “Red List,” along with the CITES Appendix III, translates into simply using caution by ensuring certified or plantation harvested lumber from those Latin American countries not cited in CITES. One issue that arises is that the plantation-grown lumber is younger and therefore less durable than the slower-growing trees that grow wild. While J. Gibson McIlvain is committed to environmental sustainability, we’re also dedicated to our long-time pledge to use only the highest quality lumber; that balance is increasingly difficult to achieve, but we’re dedicated to finding ways to continue to deliver top-quality Spanish Cedar and other lumbers in an environmentally sustainable manner. We plan to continue dealing quality Spanish Cedar lumber for many years to come.